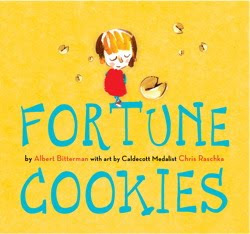 It’s your lucky day if you find yourself in possession of Fortune Cookies by Albert Bitterman (Beach Lane). In a concisely told, carefully conceived story, a girl receives a box of seven fortune cookies. Her first fortune says, “Today you will lose something you don’t need.” And, voila, she loses her tooth, which she puts under her pillow. The next day her fortune reads, “Money is like the wind.” So she buys a kite with her tooth-fairy money. As the week and fortunes go on, she enjoys good fortune and weathers bad, in the end getting to keep the good: seven kittens. Chris Raschka’s translucent yet vibrant watercolors loom large on the expansive white pages, and the fortunes are printed on tabs that readers pull from inside each cookie. The tabs are exceptionally sturdy — something you’d expect from a bookseller-author. Bitterman, whose real name is Pete Cowdin, is the owner of the Reading Reptile bookstore in Kansas City. “A. Bitterman” is the pseudonym Cowdin uses on his bookstore blog. Be sure to check out “Ten Seconds: Running the Hurdles with Harry Potter,” a hilarious, heartbreaking description of his thought process when a customer turns down Jenny and the Cat Club for her six-year-old granddaughter, who’s already “reading Harry Potter. All by herself.” No fortune cookies for that poor girl — or her grandma. >Sounds like a great book. I will have to check it out. Thanks for the review!